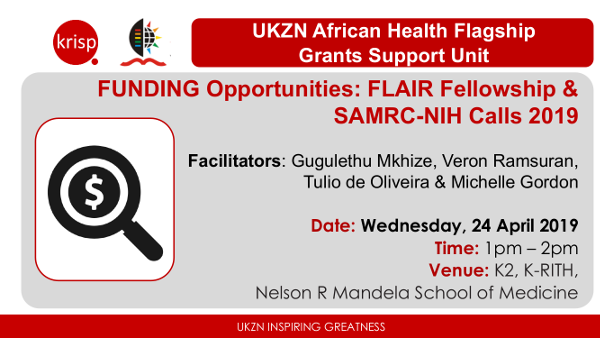 UKZN African Health Flagship Grants Support Unit discuss about new funding opportunities: AAS and Royal Society FLAIR Fellowship & SAMRC-NIH Calls 2019. Wednesday, 24 April 2019 (1:00pm - 2:00pm), K-RITH building, Nelson R Mandela School of Medicine, UKZN, Durban, South Africa. All welcome!